Effect: Popup menu, Default: Color . Type of TV to simulate: color or black & white. Color: simulates a color TV. Mono: simulates a black & white TV. Reception Master: Default: 0.4, Range: 0 or greater, Shared . Master control for all reception-oriented artifacts: static, interference, ghosting, horizontal and vertical hold, hum bars, and color stripes. Turn to zero to get perfect reception, i.e. zero of each of the above artifacts. Tv Pixels: Default: 720, Range: 1 or greater, Shared . Static Amplitude: Default: 0.8, Range: 0 or greater, Shared . Static Density: Default: 0.7, Range: 0.01 to 1, Shared . Interference Amp: Default: 0.6, Range: 0 or greater, Shared . Ghost Amplitude: Default: 0.6, Range: 0 or greater, Shared . Horizontal Hold: Default: 0.5, Range: 0 or greater, Shared . This causes the image to shift horizontally in a semi-random way, simulating a TV with a bad horizontal hold circuit, or a signal not strong enough to engage the horizontal hold. Scaled by Reception Master. Vertical Hold: Default: 0.8, Range: 0 to 2, Shared . This causes the image to shift vertically in a rolling motion, and is normally caused by a weak signal preventing the TV from locking on. This parameter controls the fraction of the time that the image is having hold problems. Set to zero for no vertical hold problems. Scaled by Reception Master. Bars Amp: Default: 0.3, Range: 0 or greater, Shared . Stripes Amp: Default: 0.2, Range: 0 or greater, Shared . Fast Forward: Default: 0, Range: 0 or greater, Shared . Generates a VCR fast-forward look with torn bars across the screen. Tape Dropouts: Default: 0, Range: 0 or greater, Shared . Generates VCR dropouts on random frames, at random times. Vignette Dark: Default: 0, Range: 0 to 1, Shared . Scanlines: Default: 0.1, Range: 0 or greater, Shared . Creates visible scanlines in the image. Increase to get more intense scanlines, or set to zero for no scanlines. The width of the scanlines is controlled by the TV Pixels parameter and Scanlines Rel Freq. Scanlines Freq: Default: 1, Range: 0 or greater, Shared . 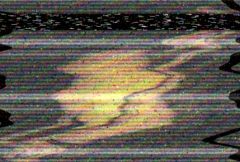 Relative frequency of the TV scanlines. Increase to get more scanlines, decrease to get fewer large scanlines. Note that the number of scanlines is also controlled by the TV Pixels parameter. Orthicon: Default: 0, Range: 0 or greater, Shared . Darkens the clip at areas around parts of the source clip that are brighter than the given threshold, to simulate a 1950s 'orthicon' TV camera look. Most useful in black & white mode. Turn Off: Default: 0, Range: 0 to 1, Shared . Animate this parameter from 0 to 1 to simulate the TV turning off. The image will turn white and shrink to a dot in the center, with a flash near the end. Fish Eye: Default: 0, Range: any, Shared . Expands the center of the source clip as if viewed through a fish-eye lens. This gives an old-time slightly rounded TV look. Num Ghosts: Integer, Default: 5, Range: 0 or greater, Shared . The number of ghost images. Some may be ahead (to the left of) the source image, most will be to the right. Some will be positive and some negative (inverted). See Shift and Negative Ghosts below. Negative Ghosts: Default: 0.5, Range: 0 to 1, Shared . The fraction of the ghosts that are negative (inverted), on average. Ghost Spacing: Default: 0.2, Range: 0 or greater, Shared . The fraction of the image width over which ghost images are spread out. Vary Position: Default: 0.3, Range: 0 to 1, Shared . Controls the regularity of the ghost image spacing. Set to zero for regularly spaced ghosts; set to one for random positioning. Ghost Shift: Default: 0.5, Range: -1 to 1, Shared . Shifts the ghost images to the left or right, without shifting the main image. Ghost Smooth: Default: 0, Range: 0 or greater, Shared . Blurs the ghost images without blurring the main image or any other artifacts. H Frequency: Default: 1.25, Range: 0 or greater, Shared . H Time Vary: Default: 0.5, Range: 0 or greater, Shared . V Frequency: Default: 2, Range: 0 or greater, Shared . V Speed: Default: 2, Range: any, Shared . V Random: Default: 0.1, Range: 0 or greater, Shared . Border Data: Default: 1, Range: 0 to 10, Shared . Roll Speed: Default: 1, Range: 0 or greater, Shared . Bars and color stripes are automatically animated to roll at this speed. Bar Frequency: Default: 1, Range: 0.1 or greater, Shared . The frequency of the bars; turn up for more thinner bars, turn down for fewer fat bars. Bar1 Width: Default: 0.35, Range: 0 to 1, Shared . Fraction of the main bar that is light; the rest is dark. Bar2 Rel Freq: Default: 6, Range: 1 or greater, Shared . Controls the frequency of the smaller bars. Stripe Frequency: Default: 10, Range: 1 or greater, Shared . Spatial frequency of the color stripes. Stripe Angle: Default: 160, Range: any, Shared . Int Frequency: Default: 1.28, Range: 0 to 500, Shared . Dots Speed: Default: 1, Range: any, Shared . FF Freq: Default: 4, Range: 0 or greater, Shared . How many fast-forward bands to create. FF Shift: Default: 0.1, Range: 0 or greater, Shared . Shifts the fast-forward bands up or down. FF Height: Default: 0.16, Range: 0 to 1, Shared . The height of each fast-forward band. Dropout Len: Default: 0.5, Range: 0 or greater, Shared . The average length of each dropout scanline. Dropout Y Thresh: Default: 0.75, Range: 0 to 1, Shared . Increase to cover more of the screen with dropouts (on average); decrease to cover less of it. If you don't see any dropouts at all on some frames, increase this parameter. Dropouts Always: Default: 1, Range: 0 to 1, Shared . Dropouts only appear on some frames; increase this parameter to see dropouts on more frames, so they occur more frequently in time. If you don't see dropouts on any frames, increase this parameter. Darks Width: Default: 0.2, Range: 0 or greater, Shared . Scales the dark glow distance. Vignt Radius: Default: 1, Range: 0 or greater, Shared . Vignt Edge Soft: Default: 0.5, Range: 0 or greater, Shared . Vignt Rel Height: Default: 0.75, Range: 0.1 or greater, Shared . Flare Width: Default: 1, Range: 0 or greater, Shared . Width of the flare or flash near the end of the turn-off sequence. Set to zero to omit this flash. Flare Brightness: Default: 2, Range: 0 or greater, Shared . Brightness of the flare or flash near the end of the turn-off sequence. Fade Out Time: Default: 0.3, Range: 0 to 1, Shared . The length of the fade out during the Turn Off sequence. A value of one produces a smooth, gradual fade as Turn Off increases. As the value decreases, the fade will start later (at higher values of Turn Off), and progress more quickly. When Fade Out Time is set to zero, the fade will cut to black instantly when Turn Off reaches one.